With increased interest in hybrid transport, the number of cars capable of saving fuel, boasting increasingly low CO2 and saving owners money has risen in recent years. Yet the emphasis has been focused on the traditional 'eco' end of the market. Honda's CR-Z seeks to challenge this stereotype, and offers drivers a sporty experience in line with its rakish looks. Along with Toyota, Honda has been in the hybrid market for a long time. Like its rival, Honda has focused on cars delivering very low emissions and fuel consumption. For critics and ken drivers, this has been at the expense of an engaging driving experience. The CR-Z has been positioned to change this. Unlike rival hybrid models, the CR-Z boasts a six-speed manual gearbox – a clear sign that driver enjoyment is a priority here. The car's sports suspension set-up and more engaging steering are further clues as to the car's potential. The combination of a 1.5-litre petrol motor and Honda's hybrid drive system ensures the car is brisk rather than an all-out performance car, though. While 114 horsepower might not sound like much, the addition help from the electric motor – which works together but not separately as in a Toyota – delivers a noticeable boost when you're keen to press on. Willing and sprightly in equal measure, the little Honda can be a rewarding drive. With plenty of grip and a slick gearshift, the CR-Z is great fun. There are trade-offs, however. With its performance leanings, the CR-Z can't match the new batch of sub-100g/km CO2 hybrids. And while Honda describes the car as a two-plus-two, even some children will find the rear seat accommodation very tight. At the end of the day, purchasing any hybrid requires you to do your sums beforehand. There's a cost-benefit trade off regarding outright economy performance, running costs and purchase price to consider. In isolation the CR-Z is a willing performer but will only ever appeal to a narrow section of the buying public. If that's you then you're in for a treat, but it pays to have an open mind. The on-paper figures for the CR-Z tell an unusual story, as although the Honda is a hybrid it's economy and CO2 figures are higher than for other similar cars. In truth, the CR-Z's slightly sporty bias is the culprit here. That said, driven hard the CR-Z should still come out ahead of a conventional rival in a back-to-back test. And when that means 35-40mpg when driven hard, it's then that you will appreciate the car's true performance. Elsewhere, Honda's well-known reliability and aftersales care should result in low annual running costs. Viewed as a two-seat coupe the CR-Z is a perfectly usable car. It's rear seats are less than inviting, however, and it's likely that even children will find it a tight squeeze. The CR-Z redeems itself with a folding rear bench that improves overall carrying capacity, while the high load lip and wide opening tailgate only serve to help matters. The cabin boasts a number of useful oddment storage areas, although the glovebox is a little small. Predictably the CR-Z's controls and displays are a little more extrovert in looks and execution than you'd find in a regular car. 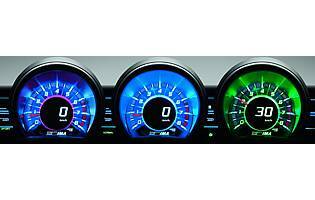 The Honda's animated main display changes colour – green, blue then red – to encourage you to drive economically, while the digital speed readout is large and easy to read when on the move. The manual gearshift is short and slick, while the steering is precise and minor controls are helpfully grouped close to the steering wheel. With the CR-Z's sporty bias comes a slightly firm ride. While the car copes well with the demands of the enthusiastic driver, it's also capable of dealing with poorly surfaced urban roads. There's plenty of room for front seat occupants but it's quite the opposite for those in the back. There's also more road noise generated than your average hatchback – something you'll notice when at motorway speeds. Although a distinctive car on the road, Honda's security package is much like ever other at this price point. In truth it's all you will likely need, unless you want to add a visible deterrent such as a steering lock to dissuade the casual thief from taking a chance. As with so many modern cars, the CR-Z boasts a considerable suite of passive and active safety measure. Alongside the generous quantity of airbags is the usual electronic traction and stability control package that proves unobtrusive – something that should please keen drivers. The CR-Z is unusual in that it's being positioned as a sporty hybrid. It also boasts a manual gearbox – another unusual feature for a car of this kind. In reality the CR-Z is a brisk compact coupe. The 1.5-litre petrol engine receives assistance from the electric motor to boost performance, and there are three modes – eco, normal, sport – which as you would expect noticeably enhance or restrict performance. The car's firm ride and pleasingly weighty steering enhance its performance appeal, although it's just at home in town. It's fair to say that the CR-Z isn't that family friendly. You'll get a pushchair in the boot and some shopping but, with access to the rear seats limited, belting in a minor could prove to be a chore if done regularly. Leaving aside the car's asking price, there's no reason why the CR-Z can't be something for the novice driver. With its easy to use controls, it's anything but intimidating. The patchy rear-three quarter view when parking is easily overcome with practice and the help of parking sensors. Low fuel consumption and running costs are other plus points to consider. Honda has long cultivated an image of high quality and reliable cars. Its fans are loyal, too. 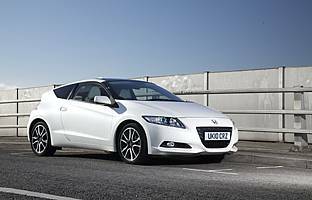 In recent years it has extended this to its hybrid range, and the first generation Insight, Civic variants and the more recent Insight have done much to strengthen its position. Being a two-door coupe, the CR-Z offers front seat occupants good levels of access. It's worth noting that the car's big doors might be an issue in tight spaces, though. It's less than ideal regarding the rear seats; access is tight and overall roominess is poor. Thankfully the car's boot is a good size and the largely ornamental rear bench can be folded forward. The basic provision is a good one, and covers all the main bases when it comes to radio and CD options. 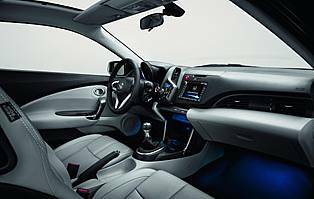 The ability to connect a digital music player is also an option, while the high-end sat-nav option is impressive and boasts a large touch screen interface. 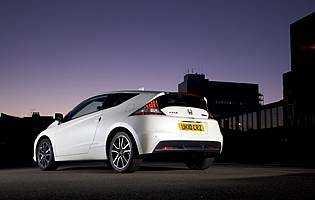 Presented in the launch colour – white – the CR-Z's bold exterior is nothing short of striking. Black is the least flattering option, with the intermediate bright and bold hues offering a welcome balance. Inside it's a typical high-class Honda cabin, although the ambience is on the somber side. A compact car by modern standards, fitting into a small space should be straightforward thanks to its light but accurate steering. Over-the-shoulder vision isn't great, however, thanks to the CR-Z's sloping roofline. Thankfully the parking sensors take much of the guesswork out of the process. Tyre inflation kit fitted as standard.